Gladwell presents a wonderful collection of stories that focus on how the underprivileged Davids of the world are not so bad off as we usually think in their fight against the Goliaths. Instead, whatever their disadvantages are, those very disadvantages often provide the perfect circumstances to beat excel. From physiological issues like dyslexia to life events like losing a parent and even the way in which authority is presented to us. Each of these would seem to seem to reduce one's chances of success but those who suffer them and persevere are stronger than those who never face such challenges. Interesting tidbit: The biblical Goliath was likely nearly blind. The posturing of our body has measurable physiological effects that can improve or degrade our situation. Apparently, childbearing is not so much tied to income (as I have been taught), however the population will continue to bloom as as birthing rating continue to drop. Taylor discusses the dichotomy those of us who enjoy democracy. At the same time we say we want to help others, we also suggest spending other people's money instead of our own. He proposes that we change the content of our political discussions. My favorite part: recapping the studies that show that we tend to associate our successes with our skills and our failure with circumstances while we do the reverse in analyzing others. To the programmer, this color arrangement is very logical and even beautiful: each row and column represents a single step through a six step progression of the three segments of the hexadecimal color system. (Just writing that statement conjures images of precessionally perfect higher orders of programmer paradise.) This is evidenced by the clustering of colors into panels of six by six. The progression of the 36 colors in each panel do not just look nice, they are also representative of three complex processes going on: base color changes, blending and shading. 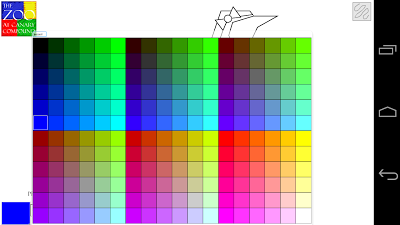 The first column and top row of each panel represent the shading steps of the pure colors which are shown at the bottom of the first column and end of the top row. Stepping back from the pure color to the upper left most swatch in the panel are the six shades for each respective color. The remaining columns and rows are simply blending the corresponding shades from each column and row together. An interesting affect to persons who frequently use paint can be observed as brighter shades blend together: they approach white. This is because in light, unlike paint, white is made by combining the three pure primary colors of light: red, green and blue. In paint, the primary colors are red, yellow and blue and when combined make black. Each panel represents a step in another six step process of changing the base color from no red, to full red. Adjusting the blending of blue and green from the base of red allows for six shades (four actual shades plus the pure color and absence of that color) to interact with of each six swatches of the other primary colors in every possible combination. This gives the color palette a total of 216 colors, which are considered the “web safe colors”. Back in the early days of the internet (as in: the days of Netscape) those 216 colors were the only colors that a developer could reliably use across all web browsers and computers. Today we are spoiled with the fairly consistent rendering of the full range 16.78 million colors possible for display technology (not to mention the animation, music and videos we also get to enjoy). 216 colors is not accidental nor is the frequent usage of six arbitrary. Indeed, as I have frequently been taught by programmers, few numbers in the computer sciences are incidental. Numbers in the computer world are generally stored in a hexadecimal format. For definition, we normally use a decimal number system. This is not referring to the numbers that come after a “.” but rather the number of items that increment the count to the next category. In a decimal system (also called “base ten”), there are 10 digits (zero through nine) before the next level is incremented. This means that the highest two digit number can be is equivalent to 99. In a hexadecimal system (also called “based 16”), there are 16 digits before the next level is incremented. To effectively communicate this, the letters “a” through “f” are used to substitute digits greater than nine. For example, “a” is equivalent to 10 and “f” is equivalent to 15 (15 plus a count for zero gives us sixteen). This means that the highest two digit number can be is equivalent to 256 (or “ff”, 16 times 16). 256 is a favorite number for computers because it can be easily built using 8-bits (while use of 8-bits is important, it is beyond the scope of this essay). 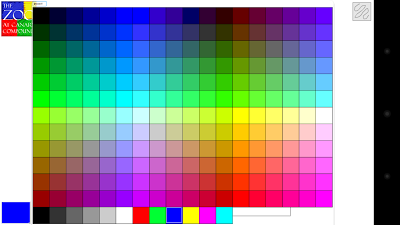 With the hexadecimal system, all 16.78 million colors a can easily be represent with a color code such as “ffffff” (pure white) or “0000ee” (the blue used by most web browsers to highlight a link). These same colors using a decimal system would be “000000000” and “000000238” respectively. Fewer digits in a sequences means less code, faster programs and more accurate communication, all very good things when under the tight constraints of sending data across the world. While most hexadecimal color systems order the colors as red, green, blue, this system orders the colors as red, blue, green. This first block has no red (hence the "00" as the first two digits) and then progress the blue down by row (the third and fourth digits) and green by column (the final two digits). I will not go through the boring process of iterating the second (or anything other) block of numbers because they are almost identical except the first two digits are "33" and thus red is incremental in each panel with the blending and shading of blue and green remaining the same. To the artist, this color arrangement is almost useless. For example, and addressing my nephew's point, finding grey is a chore. There are four shades of grey plus black and white. Black and white are easy to find in the top left and bottom right corners respectively. Greys however, are a bit harder to find: the first grey from black is in the top row, middle panel, second column, second row. The second grey is in the third panel, the next column right and the next row down from the previous grey. This pattern progresses through the panels to white in the bottom row, last panel, last column, last row. This makes perfect sense when looking at the numbers, but not when looking at the colors. Most often, when picking a color, we have a general idea of what color we want and we want to compare the shades and blends within a group of colors to get the right match. Think of paint swatches. They are clustered by base color with each swatch strip containing different shades of a given color. This system allows us to quickly compare a particular color against another particular color. Noting this, I set out to rebuild the palette to be more useful for artist (not programmers). My first thought to present a more artistically appealing color picker was to rearrange the colors by hand and sight. I got to my third swatch before I gave up. My problem: the colors progressed three dimensionally (base color, blending and shading) making it rather daunting to rearrange 216 swatches. I stopped working on the colors after rearranging three swatches; then I realized that if math got me into this predicament the math could get me out of it. My second thought was to transpose the data twice. What do you get when you transpose a data set twice? The same thing you started with (like rotating an image 180 degrees, twice). Notice how the colors now gradually (well, as gradually as can be done with a 20 percentage point increment) change between base colors by transitioning through the various shades and blends. This arrangement makes finding the right red (out of the available 30 variants of red) or green or blue much easier because the colors are generally grouped together. A good overview of the use, battling and development of naval vessel from around the world. Interesting tidbit: Original night telescopes showed the image upside-down because the extra lens needed to flip the image would degrade the image too much. Cain challenges us to respect the power of introverts instead of expecting or worse, pushing, them to be extroverts. Dinosauria is such a fascinating subject. This book opens with a rather in-depth overview of what we know (and what we are guessing) about dinosaurs and attempts to catalog most of the better know dinosaurs. Interesting tidbit: We have actual preserved impressions of dinosaur skin (in "mummified" samples). In some case, we even know what colors it was. Benton does a fantastic job detailing the evolution of geology, paleontology and other related sciences over the past couple of centuries. The author actually details the two largest mass extinctions, though he gives extra coverage to the larger of the two (which is the namesake of the book). Interesting tidbit: most of our knowledge of these past two (of the five great extinction) has been put together over the past two decades. Sometimes I think that everything we know about the 'dinosaurs' we have known forever, but no, it is common for us to have only recently figured it out. I recently met a young man whose life was “made.” His parents were rich and give him a generous monthly stipend, he had a fat trust account waiting for him when he turned 25 years old and had lacked little (if anything) growing up. Interestingly, he was not a spoiled brat. Not in the traditional sense at least. He was well mannered, generally respected the space and possessions of others and even had used his intelligence for somewhat worthwhile causes. In addition to a wealthy upbringing, his life was “made” in other ways: he had never had a rough patch in his life. High School had been a breeze, his family was almost picture perfect, people flocked to him to be his friend, he had had a one girlfriend and had never experience manual labor. As I associated with him during his first semester of college, I grew to enjoy his generally pleasing demeanor and upbeat, good, clean, fun loving attitude. While we did not hang out a lot, he lived with some friends of mine and so I would periodically run into him. I was tempted to be jealous of him from time to time—I love the thought of a trust account and the thought of how my life would be different if everything had been handed to me—until one day when we were talking about his academic goals. He was schooling for a degree in Business Management and planned of getting a Master of Business Administration after that. I am always confused as to why anyone would get a degree in Business Management (because it teaches so few real skills and instead stuffs the heads of young people full of theories on how businesses should work), so I inquired why he was pursuing such. The answer: because his grandfather did (and got rich from it) and his dad did (and got rich from it) so too would he (and, he hoped, would get rich from it). The fatal flaw in his thinking is that he had no idea what “business” even is let alone important things like how his ancestors got rich with business degrees. He just knew that they did. At first it was comical to probe this area of his mind but as naivety turned to ignorance and then to lack of comprehension I started to get worried. How could he get a degree in something that they knew nothing (and I mean nothing) about? To be clear, I do not expect most students pursuing university degrees or trade certificates to be experts in their field of study (if so, why would be there?). I do expect them to have at least a basic understanding of their chosen field. If one is going to spend four years of their life studying something, they should have some idea what that field entails. There was none of that here. He knew that businesses ran stores and stores charged money and he swiped a card to pay them. He did not know how the store figured out what should go on which shelves where, what it meant to buy a share of stock or even how the store shelves got restocked. It was all a mystery. Beyond the mysteries of the business degree he was seeking, I also became disturbingly aware of his complete lack of cognitive empathy. That is, he could not imagine what other people experienced (as opposed to affective empathy in which one can relate to others’ experiences because one has experienced similar). That became glaringly obvious one day when he got into an argument with one of my former roommates. In this argument, the young man became vehement as he wondered how anyone could be such a failure as to be “old” (by which he was meaning, 25 years old) and not be married when he had arrange for his girlfriend of four years to marry him at age 21. Further, he could not understand how one could surpass 24 years old without getting a degree. Anyone, he exclaimed, who did not do well in school should just drop out because they were not smart enough to it and perseverance was a myth. These were scathing words from one so young to one not much older; yet they were also very telling of the young man’s easy life. He had never known the difficulty of finding a girl that he liked who liked him back. His girlfriend seemed to not know that other boys even existed. Beyond that, he seemed to think that plans laid in teenage years were all but assured to come true. Thus a failure to be married at 21 was a failure to plan correctly and had little to do with one’s circumstances. College, he believed, should be as easy as High School. High School was a venue that he saw very little of. He had one of the easiest High School experiences I had ever heard of including very, very generous absent policies. Further, college was just a recap of prior schooling so if you learned it the first time you should be able to show up for the test (and ace it) without issue. Perhaps ironically or perhaps tragically, he failed his first semester of classes. Things like depression, sadness and all but the most obvious of physical pain (things like getting punched in the gut and not things like aching bones) were all just figments of imagination and as such could easily be overcome by simply dismissing the thoughts. Thus his spoiling was not in his meticulous manners but was an inability to understand the troubles of those around him. In other words, his life had been so easy that he had never developed empathy sufficient enough to even imagine some of the most basic ailments of his associates. The saddest part for me was the realization that he would eventually have to trudge through sorrow equal to the joys he had known and that while in a dark valley that to most of us would be little more than a “bad day” he would feel like he had just descended into nethermost depths of the inner bowels of the earth never to emerge into the light of day again. Life, that which had once come so easy, was going to become seemingly very, very hard. Only seemingly though because compared to everyone else, his troubles will be nothing new; indeed for some his soon-to-come difficult experiences would be seen as “everyday life.” This is where the darkness of his path will come. For where this young man could not have empathy for those with hard lives, others would not have sympathy for his easy life. Realizing how much cognitive empathy has helped me in my life, I was no longer tempted to be jealous of my friend but, instead, to pity him and the smallness of his world—rather, the bigness of the world that he cannot yet understand—and the great pains of growth that I hope he accepts as he an opportunity to grasp the larger world. That being said, if I could get a fat trust fund in addition to my empathy, I would take it. A not so interesting update on the very interesting topic of Google's self-driving cars. Hartford describes ways in which Trial and Error development trumps the God Complex method of development (i.e. bringing in a smart person who has all the answers). Instead of looking for the ‘single best’ answer (which Hartford shows has failed time and again), he encourages a use of the old-fashioned ‘trial and error’ (which Hartford shows generally succeeds). A cool demonstration of what the future may bring: a device that can read your brainwaves.